It used to be that March was only on my radar because I was (am?) kind of crazy-into college basketball. Madness. Guilty as charged. But these latter days, March has taken on a much deeper meaning in our house. You see, we're moving our family's life in an off-off grid direction. (No, that second "off" wasn't a typo. Keep reading.) Our family has been inching toward more provident living (that's self-sufficiency with less emphasis on "self" and more on "God") for about 12 years now, in teensy-tiny baby steps. So for that month, we decided to dedicate every day to do something to move us toward our goal - even if that something was just an intellectual exercise. 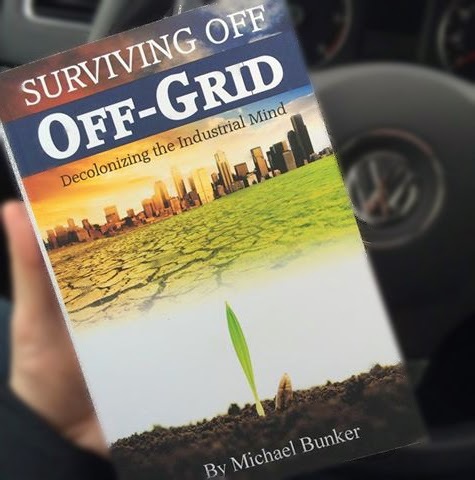 And we shared it with a friend who shared with with the world: You can read about last year's March Off Grid at the Beyond Off Grid Blog, or on the March Off Grid Facebook page. A lot of folks have asked us about it (and it always reminds me a bit of John Lennon's Happy Xmas song): It's been a year and what have you done? 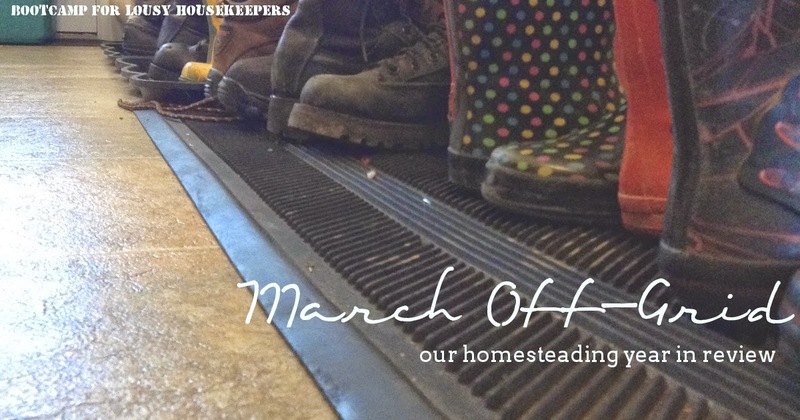 Without further ado, I bring you the monthly play-by-play for our March Off-Grid -- Our homesteading year in review. 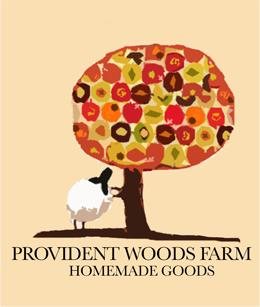 We were really excited to keep the momentum going and we were bound and determined that, Lord willing, we would get the house ready for a late spring sale and be moving to our homestead -- some homestead -- in the summer. So our April was filled with fixer-upper projects on the home and property, like cleaning out the barn, scrubbing the outside of the house (our tiny piece of Ohio attracts green house-moss like an Oregon rain forest), clearing trails in the woods around our house and laying straw on those trails. We also stepped up our minimalism, working on getting rid of unneeded things we had collected in the four years in that property. Closing and move-in day, at long last. We had tons of fun playing musical chairs with all the large pieces of furniture. This is the dining room. (Move the table and chairs.) No, this is. (Move the table and chairs.) No, THIS is. (Move the table and chairs.) It would be so helpful if there was a special font for sarcasm. General unpacking and clearing out areas near the house ensued. The property was very well-loved by the previous owners, who treated all creatures, great and small, with loving kindness. In other words, we had to "convince" the huge raccoon family to move on, and we had to overcome large colonies of spiders and flying ants in the house. Good times. The men-folk picked up our winter's worth of cord wood and began stacking, stacking, stacking. They also cleared a lot of dense growth from the woods nearest the house. Inside, we got an off-grid grain mill. Got rid of lots of on-grid things, so we could buy more off-grid things. Consumerism. Sigh. We also got a beautiful baby girl and I got really exhausted. This month brought a lot of excitement to the homestead as quite a few HUGE trees very close (or overhanging) the house had to come down. It was too big (read:unsafe) for us to do ourselves with little experience, so we hired a crew for the cutting. That was fun and excitement for a few days, to be sure, safe behind the glass. 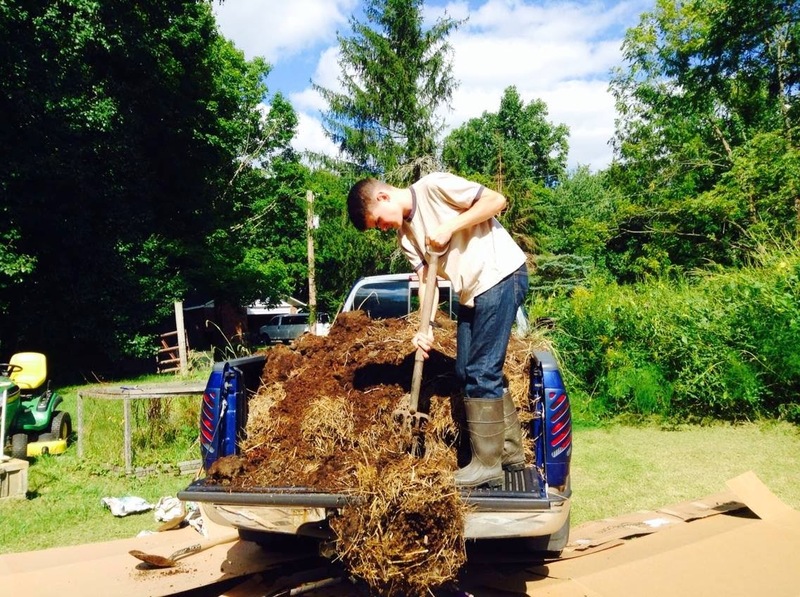 My men-folk began making trips back and forth to the horse farm that aligns our property, as the owner generously offered us all the composted manure a girl could wish for. We also geared back up for a new homeschool year, although in the pioneer tradition of the past, when Pa announces it's a work day we drop school and line up to receive our detail. (This was hard for me to swallow at first, having been a dictatorial schedule-oriented homeschool mom for so many years, but I'm actually really loving it. There is always a rainy day around the corner to get caught up on history reading. Always. This is Ohio, after all. We also picked up 895 pounds worth of bulk organic basics for our pantry. Teenage boys, y'all. This involved creating an inventory and learning how to properly store bulk goods, and I became a food-grade bucket finding ninja. Hy-yah! My brilliant husband sold off some of the walnut trees that were cut last month, which paid for the tree crew. So more big trucks on the homestead. Presently, the men-folk spend every available moment cutting, splitting, and stacking wood, as this will be our first winter heating with wood. Jason learned to clean the chimney and use the indoor wood stove (which had been converted from a coal-burning stove, had a lot of moving parts, yet had no instruction manual). The soundtrack to October would be something with a fast-moving fiddle and a lot of chainsaw in the background. Speaking of chainsaws, Jason got another one. Merry Christmas, Babe. Personally, I joined the Traditional Cooking School at GNOWFGLINS, and began an Essential Oils course from Vintage Remedies. "How much Wood would a Wood Schaap cut if a Wood Schaap could cut Wood?" Cue the chainsaw buzz and the thump of axes. Even the seven-year old is handy with a half-size axe, and the older boys are now requesting things like mauls and wedges for Christmas. It brings joy to this homesteading momma's heart! We began burning the wood this month, which meant hauling it in from the Holz Hausen "beehive" stacks they built earlier in the fall. The prior owners added a lovely screened in porch "for company" on the back, and we turned it into a lovely facility "for wood storage". Jason, our eldest son and I all mastered the art of using the wood stove. When I say "art", I mean it. I had no idea it took so much thinking and timing to get a good burn going, not wasting wood, nor hot air, nor burning down the house. Not too much we could do outside in December, apart from lots of romps in the snow and sledding down Caesar Creek Dam. And shoveling. So much shoveling. It's a strange time - I've always loved winter, but this year I was very anxious for warmer weather to come, as it meant getting back outside and PROJECTS. Always lots of projects. I researched various methods for doing off-grid laundry, and Jason gifted me with a laundry plunger, which I use for small batches. I am still coveting a James Washer for outside use in warmer weather. We'll see. We installed a laundry line in front of the wood stove and can move two laundry loads a day through it when it's really cold outside. Meanwhile, I'm still working through my personal courses, and I'm learning how to Knook - a cross between knitting and crocheting - because my fingers need to keep busy while they're not digging in the dirt. 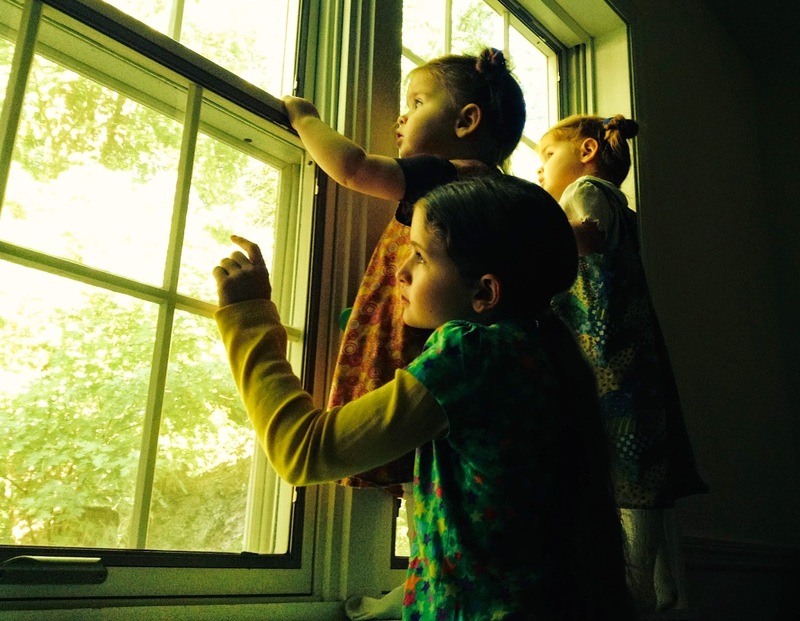 We also pushed through homeschool double-time, and enjoyed three feast days. December is always such a wonderful month. Oh! Seed catalogs! What a wonderful glimpse of spring, even in the dark, cold days of winter. We begin planning the actual garden. Mouths watering, imaginations soaring! We are chugging along, logging school hours at break-neck speed, and now comes the time of LISTS. LISTS as far as the eye can see. LISTS that correspond to PROJECTS. There is so very much to be done, and I am so antsy to get going. Sometimes at night when I am supposed to be asleep and Jason is supposed to be asleep we both lay there and you can practically here our brains whirring like a bogged down computer. I discovered the wonderful homestead printables by Quinn at Reformation Acres, and I've had so very much fun creating a homesteading binder. (Y'all know how I love my binders!) Even though many of my sheets are still blank - just looking through them has me dreaming and drooling for the homesteading months and years to come! The excitement is building. Jason begins what is a multi-month process of spending inordinate amounts of time on the phone with the "well guy", the "wood stove guy", the "barn guy", the "manure guy", the "septic guy", the "fence guy"…the list goes on and on. And never just asking them to come do the work, but drilling them (in the way only my beloved journalist husband can) on HOW to do things, WHY they do things the way they do, and so on. We have a date set for our first infrastructure project: fencing. When the ground dries out, the fence will go up. Like most homestead projects, it seems that to complete one task, we must complete ten others first. The fence is big PROJECT NUMBER ONE for the spring, but of course, the trees must be cleared. YES. There are still huge fallen trees out there, not for my men-folk's lack of trying. Whenever rain or snow is not falling, they are still out there cutting, splitting, stacking. Excitement! My parents, who both retired in the last few years, have decided to sell their house in my beloved Kansas this summer and move here to our corner of Ohio. Of course, we'd love it if they could move on to our property, or nearby. There is now a list for that, as well. Yippee! Has it been a year since we dedicated ourselves to do this? Fugit irreparabile tempus, as the Romans said. Of course, we're closer to Kentucky where it sounds more like "Time, she's a flyin'". New property, new home, new member of the family. Big Year, y'all. I intended to blog about our year Marching Off-Grid at the beginning of March, but alas. My dear Jason's mantra: When you have eight children, that leaves you seven minutes a day to do anything YOU wanted to do. Jason brought home a big 'ol white board for the dining room. My inner-Martha Stewart fought a cage match with my inner-MaryJane Butters, but the farm girl won and I like it now. 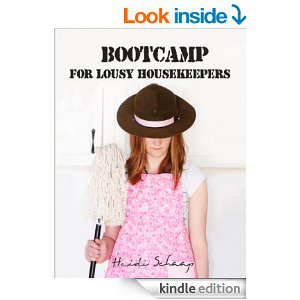 It holds the lists of everything we need to/want to accomplish in the next homesteading year. Despite the farm projects list being the size of Texas, it is not really a burden. We are all feeling so much EXCITEMENT this month! Research. Reading. Reading some more. Pinterest. Blogs. The new-to-me art of "project proposals". Oh, how I love having a husband who trusts me to do the book-learnin' and submit my ideas to him. Chicken coop plans are in the works, hatchery catalogs are at hand, seed lists are prepared, and wood mulch is going down on the composted manure just as soon as the rain stops. (Will the rain ever stop? History tells me "yes", my heart tells me "no".) Spring is peeking out at every turn on our homestead. 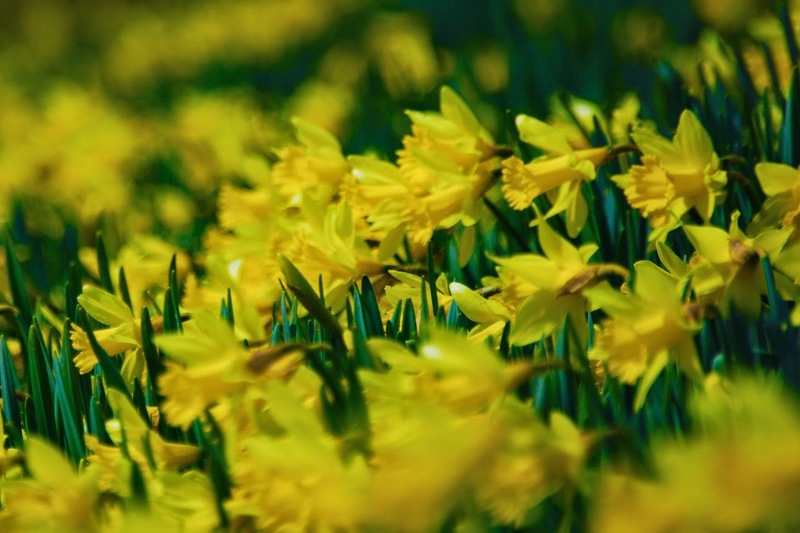 A prior owner, way back in the 60's, planted over 30,000 daffodils and other mixed bulbs on the land. The woods have grown deep around them, and it's such a treat to walk out there, turn the corner, and see a riot of color. Spring. Yes! I truly thank God that we are here, and Lord willing, there is such a year in store for us. 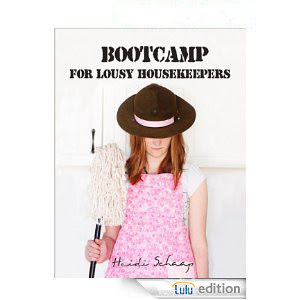 ...I am determined to stay more up to date with our life here on our little homestead. Please visit often and see what we're up to! Thanks for sharing in this journey with me! P.S. Some of my links are affiliate links. That means I get a tiny bit back if you choose to purchase a linked item. It doesn't cost you anything, but it might help me buy another chicken...Win-Win! Thanks!